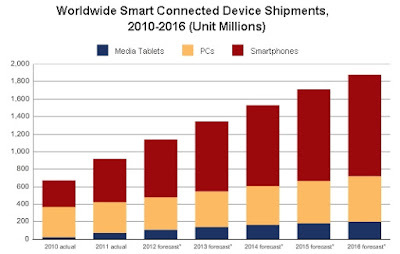 According to the latest market study by International Data Corporation (IDC), smart connected devices -- including PCs, media tablets and smartphones -- saw shipments of more than 916 million units and revenues surpassing $489 billion in 2011. "Whether it's consumers looking for a phone that can tap into several robust app ecosystems, businesses looking at deploying tablet devices into their environments, or educational institutions working to update their school's computer labs, smart, connected, compute-capable devices are playing an increasingly important role in nearly every individual's life," said Bob O'Donnell, vice president, Clients and Displays at IDC. Looking ahead, unit shipments for smart connected devices should top 1.1 billion worldwide in 2012. By 2016, IDC predicts shipments will reach 1.84 billion units, more than double the 2011 figure, as consumers and business around the world are using more smart connected devices. This upside growth equates to a compound annual growth rate (CAGR) of 15.4 percent for the five-year forecast period. In terms of platforms, IDC expects a relatively dramatic shift between 2011 and 2016, with the once-dominant Windows on x86 platform, consisting of PCs running the Windows operating system on any x86-compatible CPU, slipping from a leading 35.9 percent share in 2011 down to 25.1 percent in 2016. The number of Google Android-based devices running on ARM CPUs, on the other hand, will grow modestly from 29.4 percent share in 2011 to a market-leading 31.1 percent share in 2016. Meanwhile, Apple iOS-based devices will grow from 14.6 percent share in 2011 to 17.3 percent in 2016. "Android's growth is tied directly to the propagation of lower-priced devices," said Tom Mainelli, research director, Mobile Connected Devices at IDC. While IDC expects that dozens of hardware vendors will own some share in the Android market, many will find profitability difficult to sustain. Similarly, they expect a large percentage of application developers to continue to focus their efforts on iOS, despite the platform's smaller overall market share. Research conducted by IDC suggests that many individuals own and regularly use multiple smart connected devices. "We are in the multi-device age," continued O'Donnell, "and we believe the number of people who use multiple devices will only continue to increase." Moving forward, the challenge will be to integrate all these devices into a unified whole through use of personal cloud-type applications and services. Smartphone growth will be driven by Asia-Pacific countries -- especially China -- where mobile operators are subsidizing the purchase of 3G smartphones, thus increasing the total addressable market. In many if not all instances, the smartphone will be the primary connection to the Internet. In countries where devices are not subsidized by the mobile operators, competitive and component-based pricing will help drive volume.